Warm up with wintery scents, flavours and textures. Dietitian Lisa Donaldson shares some tips for a nourishing winter kitchen. On a winter’s day you can’t go past soups, roasts and oats. Not only are they hearty and comforting, they can provide a range of valuable nutrients. Eating well means your body will be nourished with all the nutrients it needs, boosting immunity and leaving you better equipped to fight off germs and bugs that cause winter sniffles. You’ll feel your best, so you’ll be more likely to get out and about, rather than hibernating. And it can help you avoid winter weight gain, reducing your risk of health issues down the track. Wintery flavours of garlic, rosemary and cinnamon are the perfect ingredients to have on hand. Their scent brings cosiness into your home, and for many they bring memories of warm and comforting winter meals made with love. Garlic contains the antioxidant allicin, which has anti-viral properties and may help reduce your risk of catching colds. It is also adds a flavour punch to a hearty chicken soup. Rosemary is one of the most aromatic herbs. It’s a nice addition to roast lamb and roasted root vegetables. When combined with wintery vegetables you have a fibre-rich and flavoursome meal. Cinnamon is a great addition to a warm bowl of oats. There is emerging science that explores cinnamon as a potential way to control blood glucose levels. Plus, it’s so flavoursome you can put away the brown sugar. Add root vegetables, barley and legumes to a pot of soup or a casserole. The starchy nature of these fibre-packed ingredients will thicken a stew without the need to add flour, butter or cream. 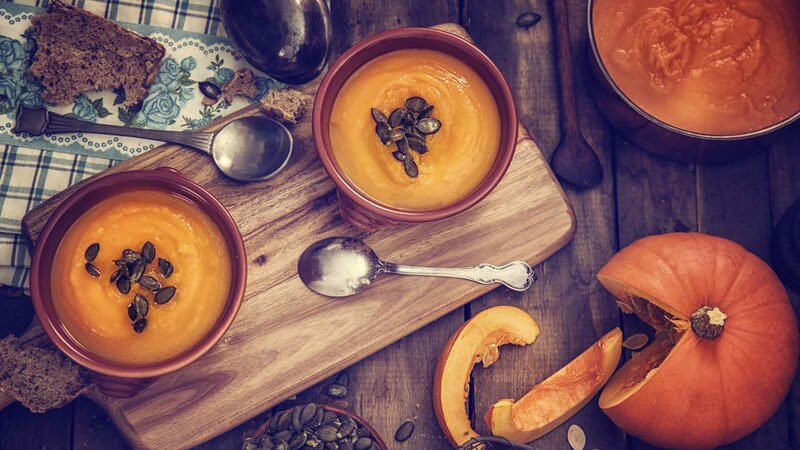 If you love cream on top of your pumpkin soup, try a dollop of natural yoghurt with some cinnamon and nutmeg instead. Cook your oats in milk for added protein and creaminess, then top with yoghurt, sliced banana and cinnamon. Choose lean meats and load your dishes with non-starchy greens like broccoli and zucchini. Top your pies with a vegetable mash rather than a pastry. Add legumes to your Bolognese and try making noodles/pasta out of vegetables. Add chickpeas to a fiery curry and serve with cauliflower rice to sneak in some extra daily vegetables. Try to make big batches of roast veggies to add to salads or throw together quick dinners. Make double portions of your meals and freeze single serves to defrost on nights you can’t be bothered to cook. Soak oats overnight, ready to throw in the microwave to make porridge. Lisa Donaldson is an Accredited Practising Dietitian and media spokesperson for the Dietitians Association of Australia. She is the founder of FEEDinc in Canberra.